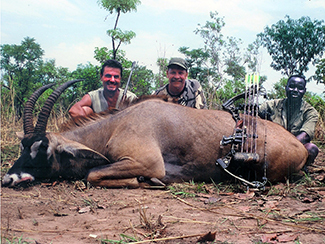 Bowhunting in West African presents new challenges for bowhunters. In the southern part of the country is the FOREST ZONE, this is true rain forest and the northern part of the country is known as the SAVANNA REGION. This area is more arid and open. The bowhunting areas are located in the southeast corner of the country, just west of the Central African Republic border and north of the Congo border. Bongo and forest sitatunga are key species, which are hunted with dogs. There are eight different species of duiker, along with both dwarf buffalo and forest elephant. These hunts require a great deal of walking and spike camping deep in the jungle; this is a very remote area. Sometime mobile camps are used and carried by Pigmy porters. The bowhunting season in the forest zone runs from the beginning of March until the end of July. These bowhunting areas are in the northeast part of the country near the border with Chad. The comfortable camps are located not far from the Bouba Njida National Park. Most concession areas have no existing villages within their borders and offers bowhunting clients a wild experience. The area is vast and the game is localized, therefore clients will be doing a fair amount of walking. Some water hole bowhunting is possible but most of the bowhunting will be spot and stalk. There are good opportunities for Roan, Defassa Waterbuck, Western Hartebeest, Red flanked duiker and other species as well. The bowhunting season in this part of the country is December through May.